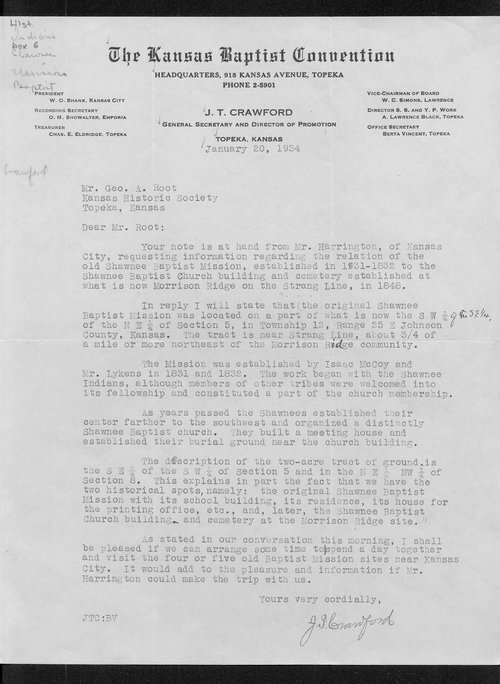 In this letter to George A. Root of the Kansas Historical Society, Reverend J.T. Crawford discusses the location of the Shawnee Baptist Mission in Kansas. Rev. Crawford states that the Shawnee Baptist Mission "was located on part of what is now the SW 1/4 of the SE 1/4 of the NE 1/4 of Section 5m in Township 12, Range 25 E Johnson County, Kansas." The accompanying newspaper entries were compiled by Grant W. Harrington, and sent to the Daughters of the American Revolution in January 1934. People - Notable Kansans - Crawford, Reverend J.T. People - Notable Kansans - Harrington, Grant W.